A Haaretz poll showing 57 percent support for Kadima MK Shaul Mofaz's peace plan "proves the Israeli public is almost always a step ahead of its leadership," sources close to Mofaz said yesterday. Mofaz's plan includes negotiations with Hamas and an interim Palestinian state on 60 percent of the West Bank in a year. "The survey results speak for themselves, and here's proof for all to see the Israeli public isn't shocked or appalled by the idea of negotiating with Hamas," one Mofaz associate said. 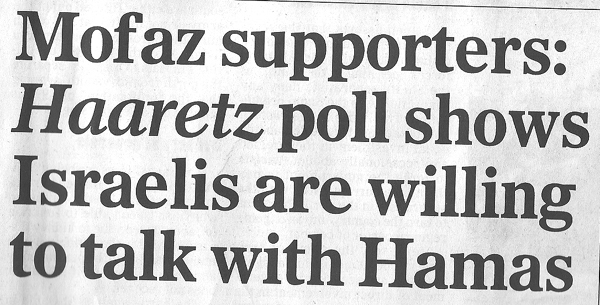 Not once does the 11 paragraph article by Mualem note that Mofaz's proposal endorses dialogue with Hamas only if the group relinquishes terrorism and recognizes Israel, a fact pointed out in the second paragraph of Friday's front-page article by Yossi Verter, also in Ha'aretz. As to the question of whether Hamas can or cannot be a side to negotiations on a peace agreement with the Palestinians, a clear majority of the Jewish public (71%) says no, while a 53% majority of the Arab public says yes.